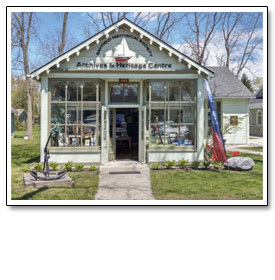 The Bayfield Historical Society is a not-for-profit group dedicated to preserving the history of Bayfield, Ontario. The society was formed in 1965 and the Heritage Centre and Archives located at 20 Main St. North is mostly operated by volunteers. The current building and land can all be attributed to generous donations. The society's board is run solely by volunteers and meets once per month for an Executive Board Meeting and once per month for a General Meeting and Speaker Series. Society archivists are volunteers and several other people have generously donated their time to document archival material. It is through the help of volunteers that the Heritage Centre is open to visitors and that the Archives Room is available for researchers. There are always new and ongoing projects to work on. If you would like to volunteer, please email us . The Bayfield Historical Society is registered as an Ontario not-for-profit corporation with charitable status, affiliated with the Ontario Historical Society and operated by a volunteer board. The Society issues tax receipts in line with Canadian taxation guidelines for donations, gifts and bequests of money, material assets and property according to the conditions made by the donor. You can help support the activities of the Society with your donations.